After the tedious exams Civil Engineering students has to go through to pass the Board exams, finally the most awaited moment has come! PRC has released the list of the students who passed the November 2016 Civil Engineering Board. According to Professional Regulation Commission (PRC) out of the 10,972 takers 5,036 passed the November 2016 Civil Engineering Board, approximately 45% passed the said Board exam. The said examination covered the following cities: Manila, Baguio, Cagayan de Oro, Cebu, Davao, Iloilo, Legazpi, Lucena, Tacloban and Zamboanga of November 2016. 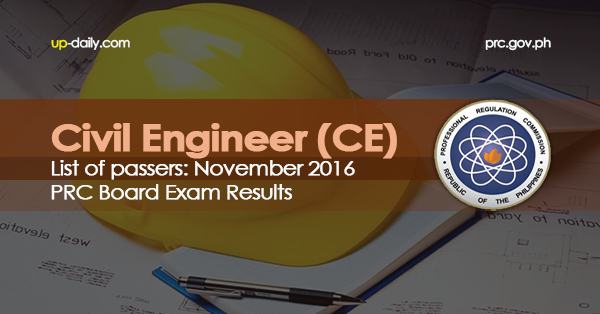 Roll of Successful Examinees in the CIVIL ENGINEER LICENSURE EXAMINATION Held on NOVEMBER 12 & 13, 2016, Released on NOVEMBER 16, 2016. This is an exciting moment for all passers, especially the Top Notchers led by Sirven Carandang Garibay from UP Los Baños with an average rating of 93.20%.